Hunters harvested approximately 243,550 deer during the 2013-14 hunting seasons, nearly equivalent to the statewide take last year, state Department of Environmental Conservation (DEC) Commissioner Joe Martens announced today. This year marked New York’s second Youth Deer Hunt, held over Columbus Day Weekend. During the Youth Deer Hunt, 14 and 15-year-old junior hunters could take one deer, antlered or antlerless, with a firearm when properly accompanied by a licensed and experienced adult mentor. An estimated 8,860 junior hunters participated in the Youth Deer Hunt, resulting in 1,275 deer taken (728 adult bucks and 547 antlerless deer). Governor Cuomo’s NY Open for Fishing and Hunting Initiative is an effort to improve recreational opportunities for sportsmen and sportswomen and to boost tourism activities throughout the state. This initiative includes streamlining fishing and hunting licenses, reducing license fees, and improving access for fishing and increasing hunting opportunities in New York State. In support of this initiative, this year’s budget includes $6 million in NY Works funding to support creating 50 new land and water access projects to connect hunters, anglers, bird watchers and others who enjoy the outdoors to more than 380,000 acres of existing state and easement lands. These 50 new access projects include building new boat launches, installing new hunting blinds and building new trails and parking areas. In addition, the 2014-15 budget includes $4 million to repair the state’s fish hatcheries; and renews and allows expanded use of crossbows for hunting in New York State. Three Port Leyden brothers who were arrested on November 8, 2011 for poaching deer at night have agreed to plea bargains in the Town of Lyonsdale Court, the Lewis County District Attorney’s Office and New York State Department of Environmental Conservation announced today. 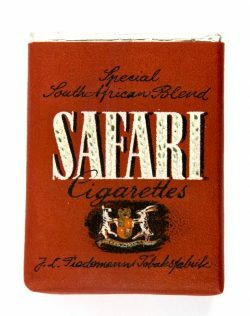 The Nagy brothers were facing up to one year in jail and up to $5,250.00 dollars in fines, had they elected to go to trial. Chase A. Nagy, age 25 – 60 days in the Lewis County Jail starting on March 7, 2012 – in addition to mandatory court surcharges. These plea bargains close out a deer poaching case that was widely reported on in the North Country area. “As sentences of incarceration tend to be more infrequent in Fish and Wildlife Law offenses, both the Environmental Conservation Police and myself believe that the sentences received in these cases reflect the seriousness with which Deer Poaching is being addressed in our community and will continue to be addressed should other individuals attempt this same crime”, stated District Attorney Moser. Violators also face the possibility of fines, mandatory court surcharges, the suspension and/or revocation of their hunting privileges, forfeiture of their firearms and even jail time, a point reinforced by the outcome of this case. The Nagy brothers were arrested for their part in the deer jacking (taking deer at night by use of a light) on River Road in the Town of Lyonsdale in Lewis County. ECOs arrested the brothers, all residing on North Pearl Street in Port Leyden. Each were charged under with three misdemeanors: 1) Illegally taking a deer not as permitted, 2) Taking a Deer with the Aid of Artificial Light and 3) Possessing an Unsecured Firearm while using Artificial Light on lands inhabited by deer. All three brothers were also charged with the violation of Taking Wildlife with the Aid of a Motor Vehicle. ECOs reported the three Nagy brothers entered a private meadow on the River Road in the Town of Lyonsdale around 9:20 PM, in a pickup truck and intentionally ran down two deer with the vehicle in the field. One of the injured deer was then shot with a 20-gauge shotgun slug and then finished off with a knife. That deer was transported back to their Port Leyden residence before the brothers returned to the same field to recover the second deer. 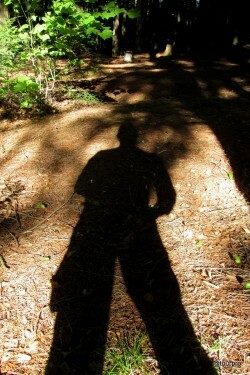 That’s when ECO Eric Roderick spotted their vehicle in the field and confronted the three brothers. A single shot 20-gauge shotgun was recovered at the scene, along with a large sheath knife. ECO Fay Fuerch, recovered the first deer from the suspect’s Port Leyden residence. ECOs were assisted at the crime scene by Lewis County Sheriff’s Deputy Brett Cronizer. The Officers returned to the crime scene the next morning and recovered the second deer and other evidence with the assistance of K-9 Handler ECO Corey Schoonover and K-9 Griz. Hunters in New York State harvested more than 228,350 deer and 1,250 bears during the 2011 hunting seasons, New York State Department of Environmental Conservation (DEC) Commissioner Joe Martens announced today. The deer take nearly matched the 2010 deer take while a new record was set for the bear harvest in southern New York. 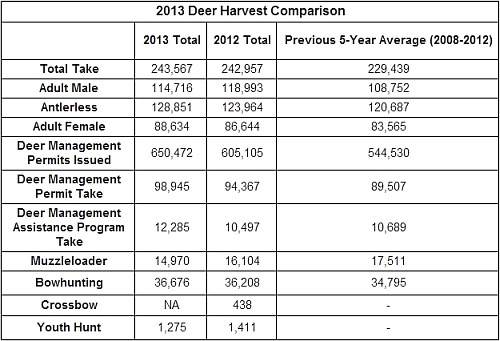 The 2011 deer take varied less than one percent from the 2010 take statewide. In 2011, hunters took slightly more than 118,350 antlerless deer (adult females and fawns) and just over 110,000 adult male deer (bucks). In the northern zone, the buck take (about 15,900) was essentially unchanged from 2010, though the antlerless harvest (about 10,900) was down about 13 percent from last year. In the southern zone, excluding Long Island, the adult buck take (about 93,100) increased nearly four percent over last year while the antlerless harvest (about 105,400) decreased by three percent. 2011 marked the first year that crossbows were allowed as a legal hunting implement for deer. However, legislation limited crossbow use to the regular firearms seasons and subsequent muzzleloader seasons for deer. Relatively few hunters took crossbows afield and the estimated take by crossbows was only 491 deer statewide, less than 0.25 percent of the total deer harvest. Throughout the state, hunters took a slightly higher proportion of 2.5-year-old and older bucks than in previous years, continuing a trend that has developed over the past two decades. Throughout most of New York, hunters can take a buck of any age, but an increasing number of hunters are voluntarily choosing to take older bucks with larger antlers. In 2011, 46 percent of harvested bucks were 2.5-years-old or older, compared to only 33 percent in 2000 and 28 percent in the early 1990s. Western New York and the Finger Lakes Region perennially lead the state in total deer-harvest densities, and deer take in 2011 remained true to form. The top five counties for 2011 were Yates (16.4 total deer per square mile), Wyoming (13.8), Genesee (10.8), Ontario (10.5), and Livingston (10.0). 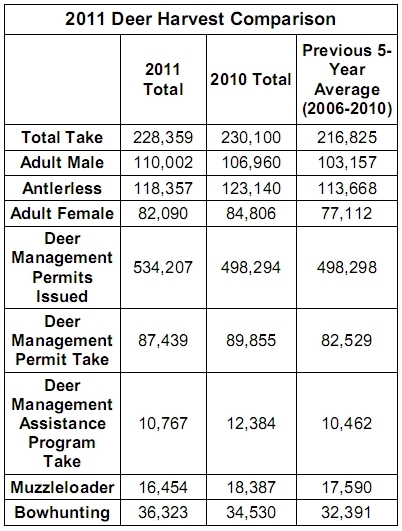 It’s important to note that the total deer harvest is strongly impacted by the number of Deer Management Permits (DMPs) available in a given area, which govern the harvest of antlerless deer and are used to manage the deer population in a given area. A more accurate picture of relative deer abundance is revealed by the number of bucks harvested per square mile. The five counties with the most bucks harvested per square mile were: Yates (5.6), Wyoming (5.4), Orange (4.1), Ontario (4.1), and Allegany (4.0). The deer populations in four of the counties listed above (all except Allegany County) are higher than the deer population objectives set for those counties. DEC will continue its efforts to reduce the deer population to achieve the desired density levels wherever necessary. establish Deer Management Focus Areas to expand the use of traditional hunting in areas with overabundant deer. 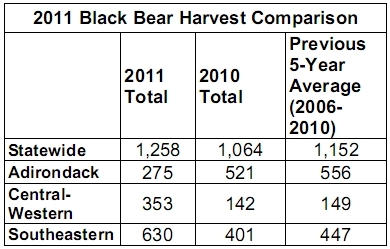 Outside of the Adirondack region the 2011 bear harvest set new records, substantially exceeding previous record takes in central and western New York. In contrast, bear take in the Adirondack region dropped to a level not seen since 1998. Hunters in southeastern New York harvested 630 bears in 2011, besting the previous record of 520 set in 2008. 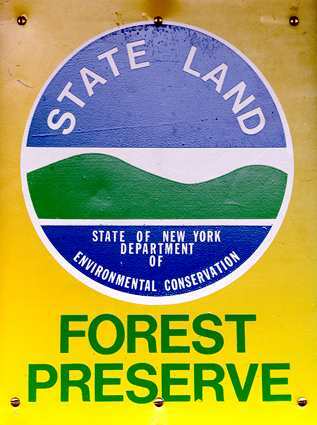 This was due in part to a new rule that expanded bear hunting in eastern New York State to include all or portions of seven new counties in eastern New York from Rockland and Westchester north to Washington beginning in 2011. Hunters took 50 bears from this new area, including 18 bears taken in Washington County, 11 in Rensselaer County, 10 in Columbia County, seven in Dutchess County, two in Putnam County and two in Rockland County. Yet even without these additional bears, take in the rest of the southeastern region exceeded previous record levels, reflecting a 25-year trend of generally increasing bear harvests in this region. In central and western New York, the 2011 bear take of 353 greatly surpassed the previous record of 193 bears set in 2008. This was due in large part to a regulation change that moved the regular bear season opening day up one week to coincide with the start of the regular deer season. This change was implemented to reduce bear population growth and range expansion. Yet, as with bear take in the southeastern region, it is likely that even without these additional seven days of the regular season in the central-western region, bear take during the traditional season would have matched or exceeded the 2008 record, reflecting a 15-year trend of generally increasing bear harvests in this region. In the Adirondacks, bear take was below the five-year average during each of the bear seasons and the overall bear take was down about 47 percent from 2010. Bear harvest rates in the Adirondacks typically drop in the early season during years of abundant soft mast (cherries, raspberries and apples), while the take will increase during the regular season in years with abundant beech nuts. This past season provided abundant soft mast, particularly raspberries and blackberries in September and October, and bear take during the early season was only 70 bears, about 70 percent below the five-year average. Beech nut abundance was mixed throughout the Adirondacks and the regular season bear take was approximately 15 percent below the five-year average. Additionally, much of the muzzleloading and regular season in the Adirondacks had above average temperatures and snow cover was inconsistent and relatively scarce making bear hunting all the more challenging.